Get paid faster from your smartphone. Experience a whole new way to factor your freight bills. Managing your business with Apex just got smarter, faster and easier! To get started, call Apex at 855-211-0923. For the fastest funding possible, you can take photos of your load’s paperwork upon delivery of freight and send the images directly to the Apex Account Management Portal (AMP). Easily create and submit invoices to Apex from your tablet or smartphone. Our app will show you the best fuel prices based on your location, or along a specific route. 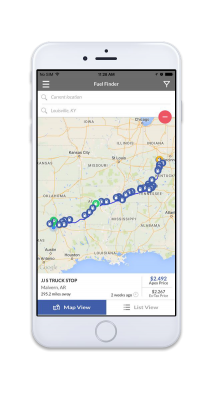 Check credit on brokers and shippers you want to work with from the convenience of your smartphone. Receive push notifications from Apex about nearby fuel savings, credit check results, promotions, and much more! You can log into your account at any time, from anywhere. In AMP, you can add users and customize the Mobile Factoring features they will need. Apex Capital is a full-service freight factoring company that specializes in small to medium-sized trucking companies. So whether you’re running one truck or 100, we’re here to help you. When you become an Apex factoring client, you can immediately take advantage of additional benefits that have been designed to help make your life a little easier. To get started, call Apex at 855-608-2739. The Apex Capital Mobile Factoring™ App can be downloaded to your tablet or smartphone (available for iOS® and Android™ devices) so you can easily access your account anytime, from anywhere. Mobile Factoring™ is a product of Apex Capital Corp.